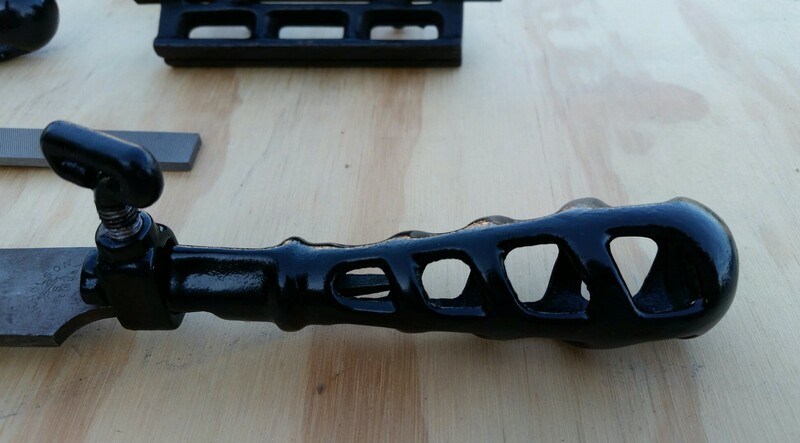 Variety of cast iron handles for various tasks. Just a mini post today, to keep things active. Sorry – I’ve been quite busy with work and family stuff lately. 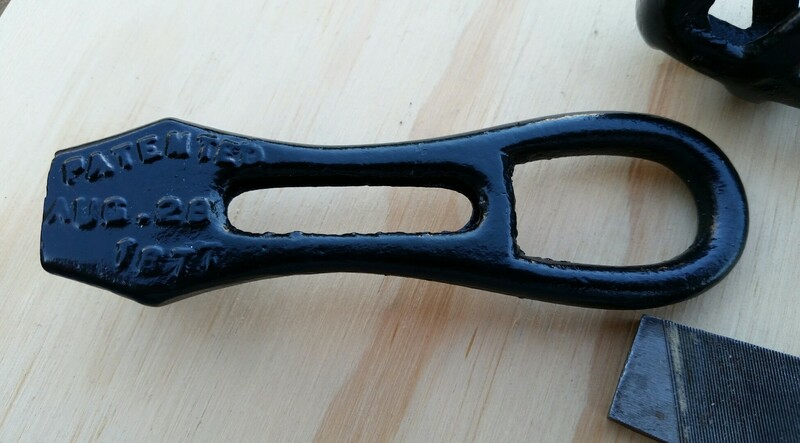 These are several of my antique cast iron file handles. I’ve cleaned up many of them with some black enamel – some of these were japanned or enameled, while others appear to be left raw. They’re magnificent little things. I love the ability to swap out files quickly and easily, then to get a really good grip on the files for working. These will handle a variety of file sizes, from little saw files to the big boys. They were also sometimes holding early soldering irons. These were made by a variety of makers, notably Durbin-Durco and EC Stearnes & Co. When I buy them, I like to pay less than $10/ea (preferably more like $5/ea), but I often see them going for a lot of money on ebay (for no real reason that I can see – they’re not super rare – probably just ignorant sellers who think they have a treasure). If you buy them, try and inspect the grip webbing for cracks, first. 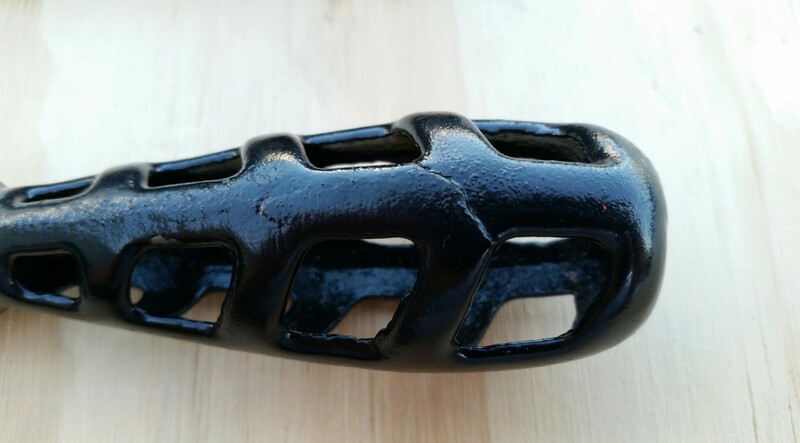 As they are a cast metal tool, they’re prone to being cracked when dropped on hard surfaces or if the user is a gorilla and cranks down too hard on them. 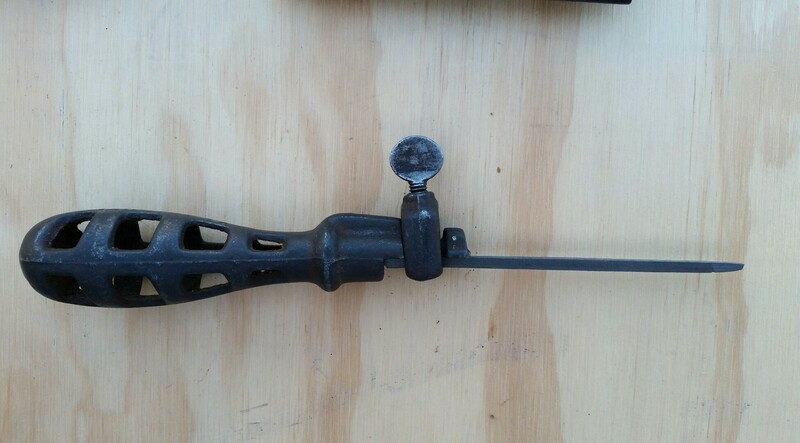 The loop-looking handle at the top is a pad saw handle. 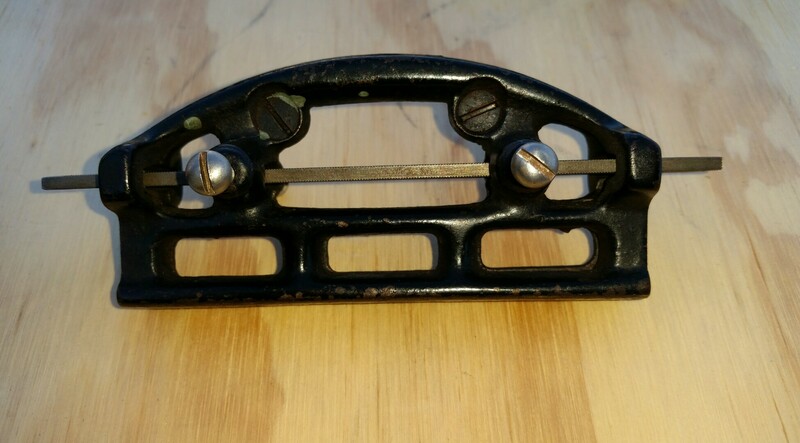 Atkins Handy Tool was one of several makers of these (not sure if mine is by them). These handles could be used for holding keyhole saws, but also came with putty knives and screwdriver attachments as well – they were an early multitool! 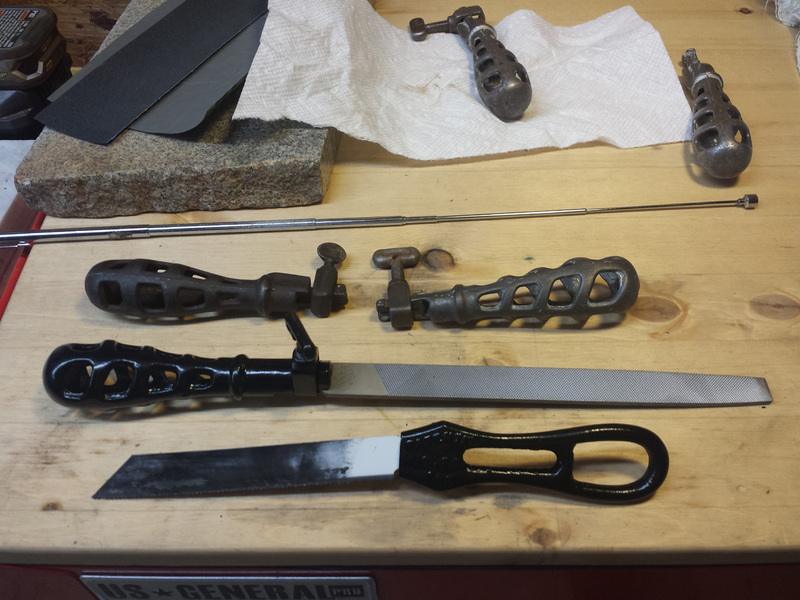 The half-moon shaped tool on the right is a hand saw jointer. It holds a little flat file (with no tang) horizontally as it is run across the tips of the teeth to level them prior to sharpening. Simple, timeless design. These ought to still be manufactured – I’m sure there would be a specialty market. I guess people just want a plastic (shudder) or wooden handle. Large, tanged files are no problem. Medium sized files work too. You can even use these handles with the smallest taper files for saw sharpening, although they need to be carefully aligned. The design is simple – almost crude. The handle has a loose fitting loop that’s tapped on the top. The underside of the loop catches the file tang against an extension of the body. 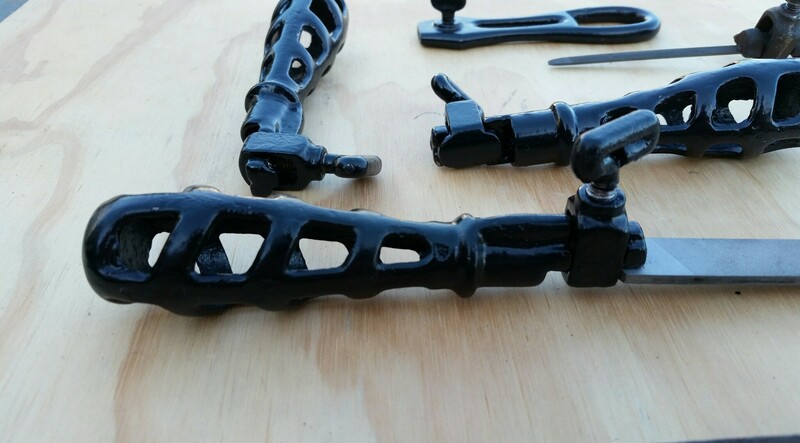 When purchasing these, remember that the castings are somewhat brittle and can be cracked, like this one. Rough handling or dropping them can break them in half. This handle should probably be relegated to gentle tasks. This is a hand saw jointer. The saw is placed teeth tips up, and the jointer runs over the teeth, holding a small file (no tang) horizontally, leveling the saw teeth prior to sharpening. You don’t have to have one, but it’s a good way to protect your fingers. 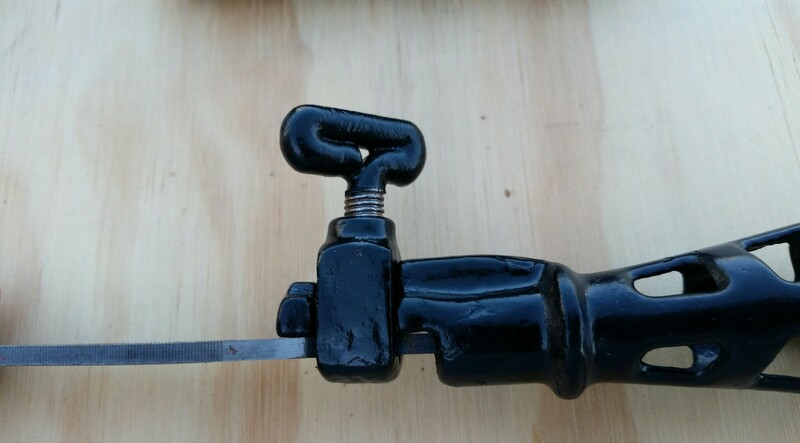 Here’s a pad saw handle (the thumb screw is on the other side). These sometimes came with a key hole blade, a putty knife attachment, and a screwdriver attachment. 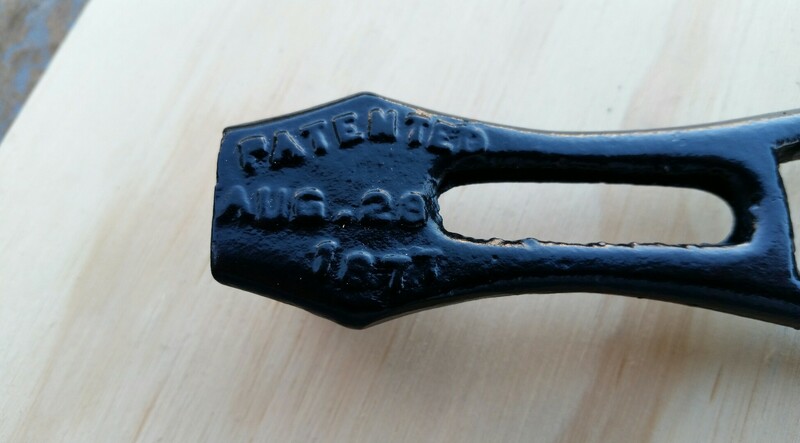 “Patented Aug. 28, 1877” Not sure of the maker, but almost certainly made in the USA, perhaps by Atkins (they were one of several makers). 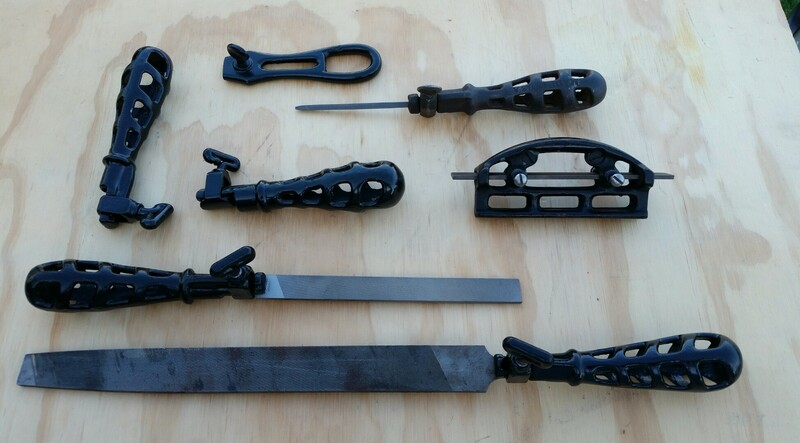 Selection of cast iron file handles and a pad saw handle. The pad saw handle works great with an old sawzall blade. I’ll probably follow up with a more comprehensive post on these, since they’re a topic of interest to me. I’ve got some web-scavenged photos of various brands and designs that I’d like to share. Until then, hope you enjoyed! Comment below if you found this post interesting.